Wow, what a beautiful home. My husband and I are building a home up in Eureka, Ca. and I'm wondering if you will share the paint brand and colors used on the exterior of your home? I love the red and green with the wood. The shingles are a natural Western Red Cedar shake clear coated with Cabot stains natural (#9100). The windows and doors are aluminum clad on the exterior. The color is Cranberry from Loewen. 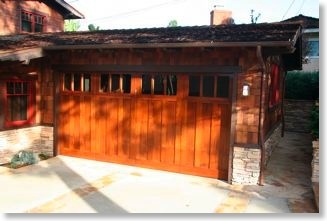 The front door and garage door are mahogany and have a diluted stain of Jel'd Stain Brown Mahogany to give it a tint. Originally, the doors were only clear coated but the sun bleached them and the light color didn't look good. After the stain, the doors were then clear coated with Varathane. I believe s Satin finish was used. The brown trim you see all around is redwood. It is stained with Cabot stains Bark color. All of the stains on the exterior are brushed, not sprayed. This makes the wood look hand worked and gives a nicer end product in my opinion. One small section was sprayed before I stopped the painters and it just didn't look good. The color came out as a solid brown and you couldn't see the wood grain. Take a look at all paint and stain colors in the Materials Used section.